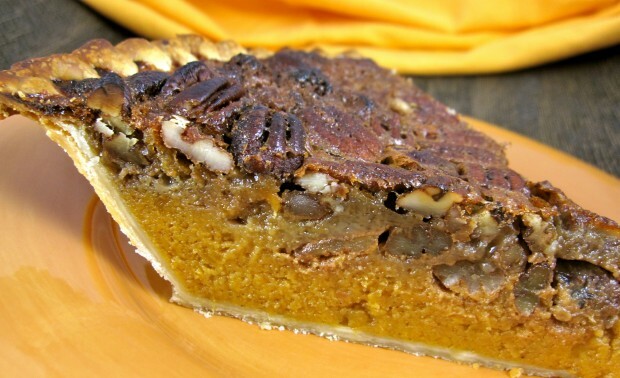 Like my favorite eggnogs, I adore sweet potato and pecan pies with a splash of bourbon in the filling. The edgy flavor of bourbon, to me, mellows the sweetness of the pie. Think Leonard Cohen romancing Marie Osmond. If you’re a fan of Marie Osmond, but never listen to Leonard Cohen, substitute kahlua for the bourbon. If you’re a Leonard Cohen fan, but Marie Osmond is not on your list, omit the kahlua and double the bourbon. If you don’t have either bourbon or kahlua on hand, omit the alcohol altogether. You will still have a wonderful pie. I spend alot of time planning holiday dinners and by the time I get to the dessert, I’m exhausted. This combination of a sweet potato and a pecan pie comes together quickly, and even inexperienced cooks will find this pie a cinch to make. At first glance, the ingredient list appears long but both pies share most of the same items. It’s clever, yet unassuming, sweet but not cloying, and certainly pertinent to the season. The texture of silky sweet potatoes combined with the sweet crunch of pecans begs a second helping. How can you fail rolling two fabulous pies into one? My daughter, Greta, is the family baker and I must give credit where credit is due. She saw a recipe similar to this in Oprah Magazine but made many changes to accommodate our family’s palate. One change was omitting the whipped topping, another was adding bourbon to the fillings. Her chief regret was not having the time to make and chill the crust. We used a Pillsbury, pre-made rolled crust for a 9-inch pie pleasing us both. 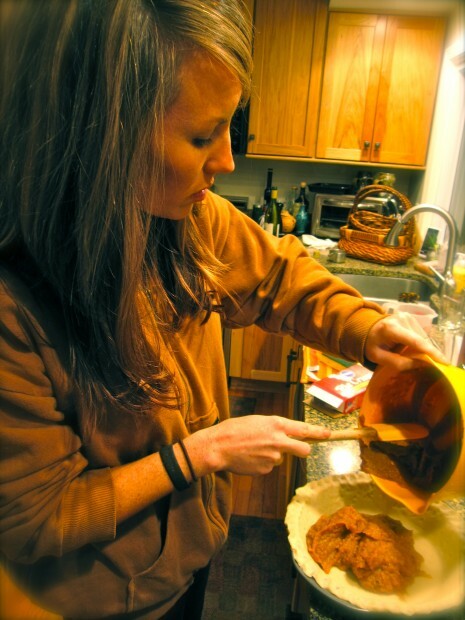 Place the pie crust into a pie pan and crimp the edges of the pie with your thumb and forefinger. Combine the sweet potatoes, eggs, sugar, maple syrup, vanilla, cinnamon, ginger, nutmeg and bourbon or kahlua, if using, in a large bowl. Pour into pie crust. Evenly sprinkle the pecans on top of the sweet potato filling. Combine the sugar, maple syrup, eggs, melted butter, vanilla and bourbon, if using, and pour it on top of the pecans. Bake in a preheated 350˚ oven until the pastry is golden brown and the pecan layer is set, about 40-50 minutes. Delicious warm, room-temperature or chilled.